The antiques and collectables world is full of highly specialised books covering specific topics, often written by enthusiastic and expert collectors. Such books cannot sell in large numbers and are essentially labours of love that painstakingly document information that would otherwise be lost forever. 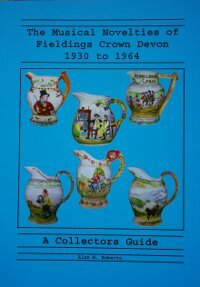 The Musical Novelties of Fielding’s Crown Devon 1930 to 1964 by Alan H. Robert is one such book. As its title suggests, it is a guide to the musical and commemorative wares produced by the Crown Devon pottery during its most prolific period. The 96-page book covers every aspect of the musical novelty ranges and starts with an alphabetical index of all the designs, enabling you to match your ‘find’ to a photo with minimum delay. A full 70 pages are devoted to photos and descriptions of all of the designs — a very comprehensive guide indeed. There’s also a useful scarcity rating, which is included with every picture description, enabling you to make effective comparisons with other items in your collection before you decide on a purchase. Musical Novelties is well written and easy to read and refer to, and if you are a fan of Crown Devon’s musical wares, then this book is an invaluable reference tool and is, I suspect, by far the most comprehensive guide available today. This entry was posted in Reviews and tagged Alan H. Roberts, Alan Roberts, Crown Devon musical, The Musical Novelties of Fieldings Crown Devon on October 12, 2012 by Perfect Pieces.